Quincy Market is a historic marketplace, located within one of Boston’s well-known gathering, shopping and entertainment districts known as Faneuil Hall Marketplace. 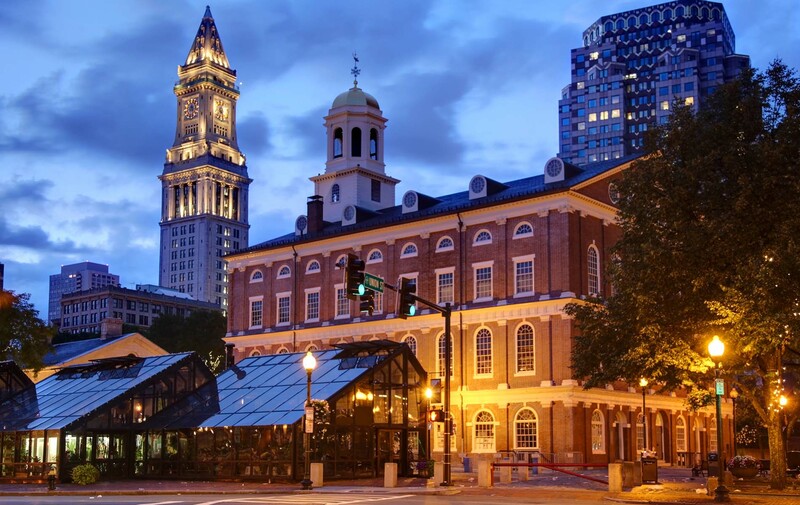 The market was built in 1826, as a mean to expand Faneuil Hall and provide additional shopping space due to Boston’s growing commercial demand. It was designed as an indoor pavilion with a complex of vendor stalls, which at the beginning hosted various grocers and produce vendors. Today, the market displays a diverse selection of food stalls, fast food vendors and is space for many restaurants. The building is shaped as a long rectangle, which showcases a remarkable copper-based dome in the center, featuring a two-story open common seating area. Quincy Market by day is a busy lunchtime space for Boston visitors and downtown workers alike. The marketplace is ideally situated among the main tourist sites and serves as a central place to sit down for a bite and enjoy the entertainment.